The Paradise Island, The Island of Gods, or as we know it better, Bali. Ancient, and with a rich cultural and religious history, Bali is one of the most beautiful vacations one can take to blow off some steam amid their hectic life. Bali’s tourist attractions are no second to any other place on earth. Though small in size, Bali offers a huge number of temples, beaches, cities and even biking and walking tours. And now that the vacation season is here, we took it upon ourselves to give you an idea of the best Bali tourist attractions. 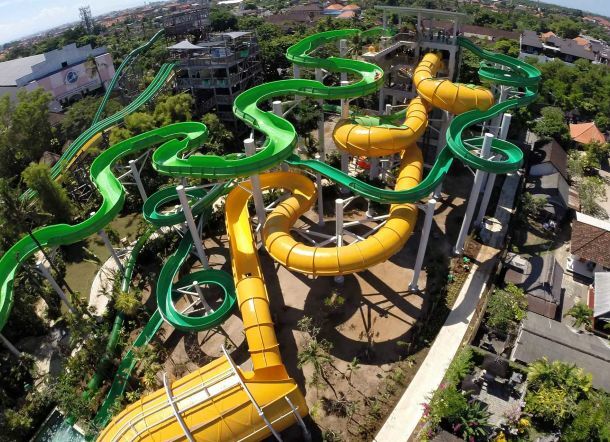 Voted the number 1 water theme park in Asia and number 2 in the world, Waterbom Bali is a place for all. Try out the adventurous water-slides or relax with your friends and family in a swim-up bar. The amusement park is open in all days except Nyepi, the day when Bali and its citizens take up silence for a day. The ultimate cycling tour of Bali in a day. Led by a local guide, the Bali cycling tour is a must for vacationers. Starting with a healthy breakfast overlooking the the volcano and lake Batur, the tour take you around the island for an up-close experience of the cultures and the landscapes which can be reached only on a bike. The “off-the-beaten” bike track gives you a view number of gems of the island. The beautiful place that Bali is,it is not possible to see all the sights within a day. 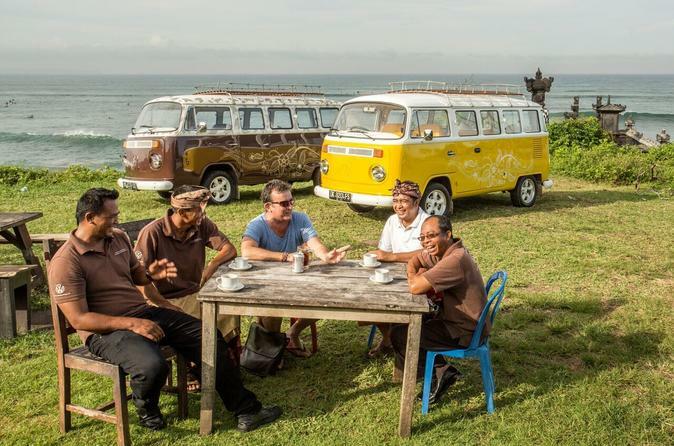 Extended and multi-day tours are very popular among the tourists of Bali. The two day tour from Java includes the Yogyakarta and Borobudur Temple and you also get to see a little of everything. Temples, UNESCO heritage sites, lush landscapes and even the Sultan’s palace where the most powerful royal family of Java lives. This is just one of the many multi day tours. The tours can also be themed, for example, a tour of national parks, or a tour of heritage sites and temples. Bali offers tourists an altogether different culinary experience. 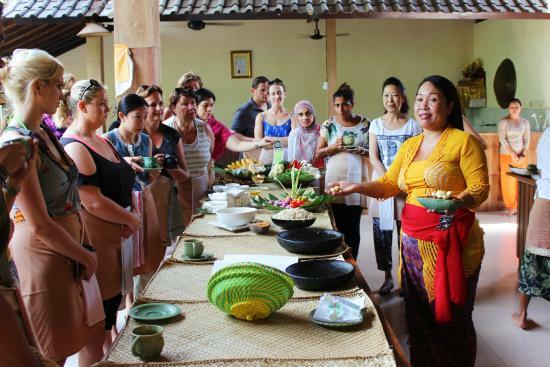 Tourists can choose one meal of the day, and be instructed by a local chef to prepare your own, Balinese food. Some of the favourites that you can learn to cook are fried bananas, coconut pancakes and other authentic Balinese food. You can visit organic markets, which are very common on the island to pick out the ingredients for your meal. If the entire point of your vacation is to chill out and remove all those tension knots from your back, look no further, Bali is the place to be. Choose whatever you want from a number of exceptional spas all over the island. Massages, steam baths, mud packs and oil treatments are just the tip of the iceberg in this place which still follow ancient methods for relaxation. 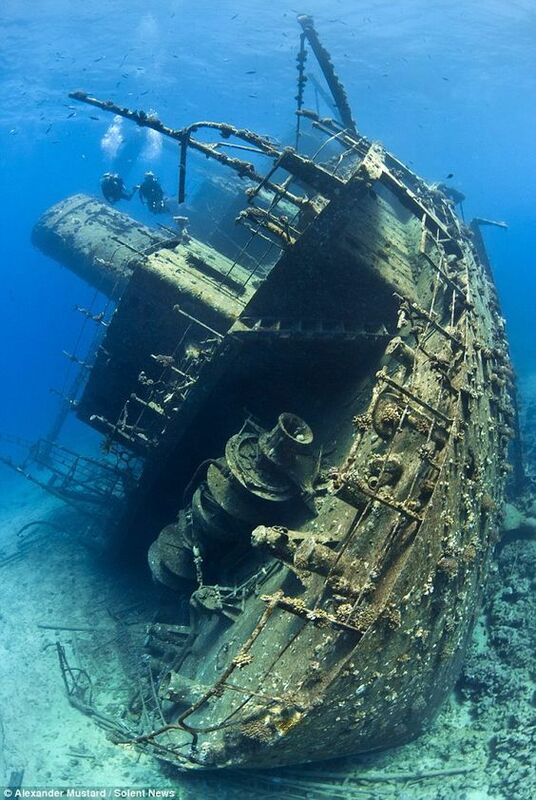 Other than being one of the most famous dive sites in all of Bali, the USS Liberty Shipwreck is the best preserved shipwrecks off the coast of the island. The ship has a colourful history of tragedies (yes, the irony is apparent). After being washed ashore by a Japanese torpedo in, it was moved onto a sand slope after a volcanic eruption of Mt. Agung in 1963. 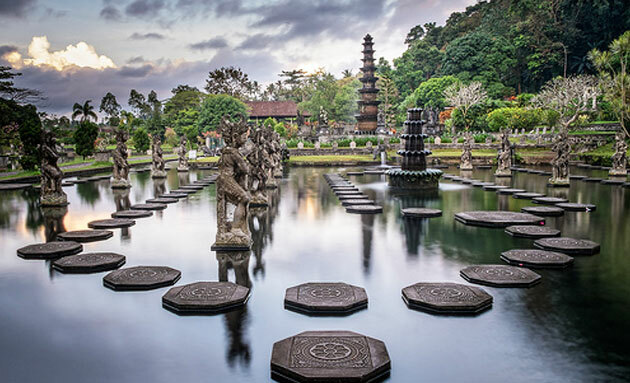 Literally translating into “water from the Ganges”, Tirta Gangga is famous for it’s water castle built by the Raja of Karangasem, Anak Agung Agung Anglurah Ketut Karangasem (it’s ok if you can’t pronounce it) in 1948. Though part of it was destroyed in 1963 during the eruption of Mt. Agung, it has been authentically rebuilt to its former magnificence. I Gusti Nyoman Lempad is a Balinese stone sculptor and architect who built the palaces and temples in Ubud and its neighboring villages. He has also contributed various linear drawings for Balinese folklore. Though it is open to the public, it is mainly used as a gallery for a group of artists. This includes Lempad’s grandchildren. 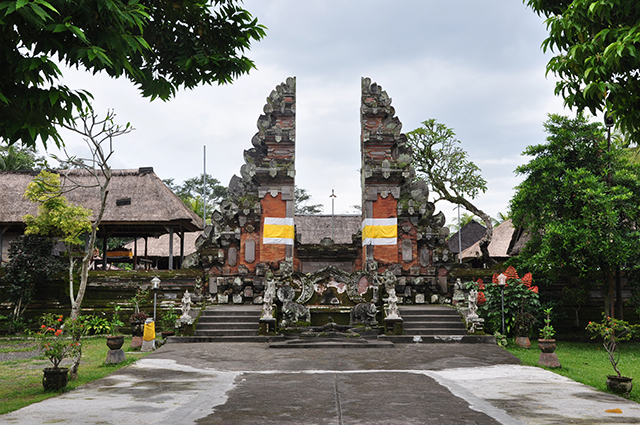 Pura Penataran Sasih is a temple rich in history and holds many questions that have kept historians wondering for many years. Once the state temple of the Pejeng Kingdom, it houses a huge bronze drum called the Fallen Moon of Pejeng. This drum holds the record for the largest single-piece cast drum in the world. It has also been determined to be around 1000-2000 years old. Researchers are not sure weather the drum was made in the Pejeng Kingdom, or if it was imported from another part of the world. Though the drum is the main attraction, do not miss the courtyard, which dates back to the 10th and 12th century. This 12th century village situated on the banks of the Pekerisan River, has sculptures and temples that are carved into the cliff faces of both sides of the river. Surrounded by rice paddies, there are 9 niches used for meditation. Moreover, at the top of the cliff, there are 3 sculptures, representing the holy trinity of Brahma, Vishnu and Siva. The Klungkung Temple, erected in the 17th century, used to be a part of the Klungkung kingdom. Majorly destroyed during the dutch invasion, the remains of the palace are now used as the court of Justice. 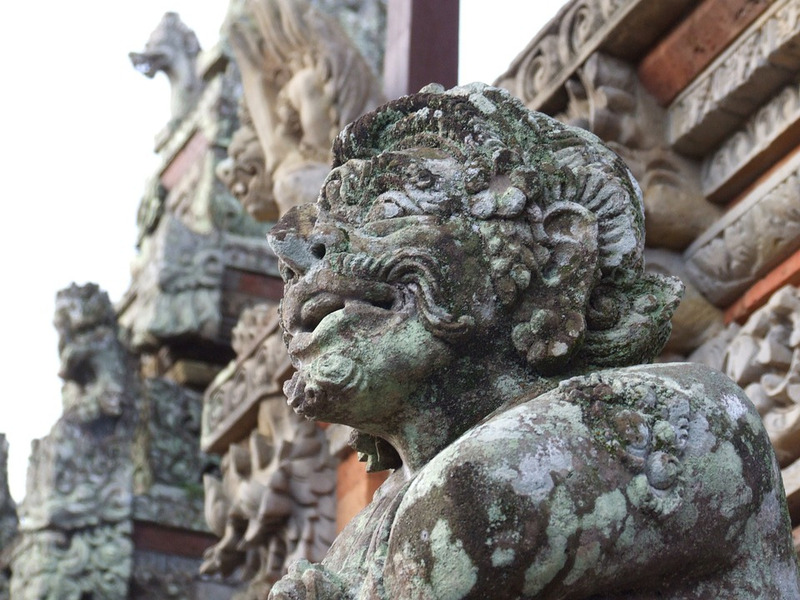 The Klungkung kingdom was considered to be the most powerful of the nine kingdoms of Bali until the Dutch Invasion. 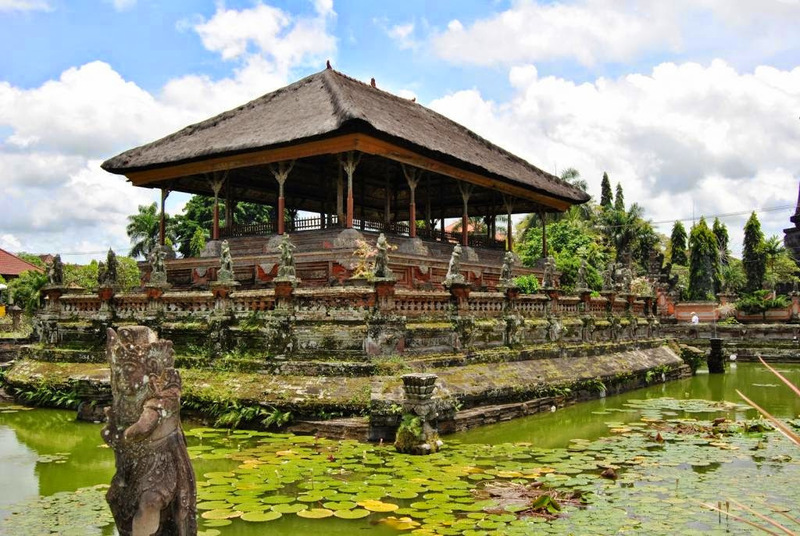 The floating pavilion is just one of the architectural wonders that the Klungkung Temple houses. 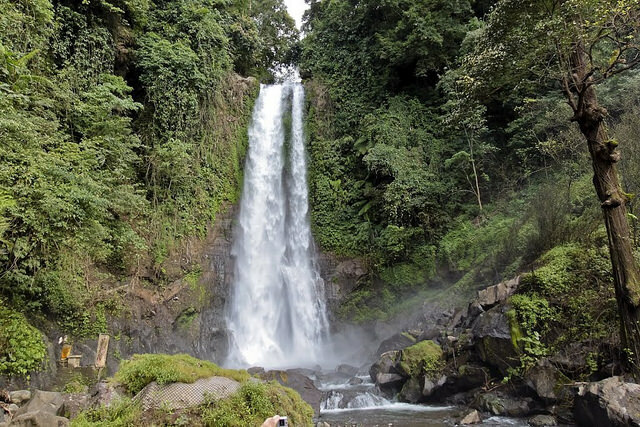 The Aling-Aling Waterfall is approximately 35 meters above the ground and is unique in it’s own way. The top of the waterfall is divided into two, and the water falls to the ground as 2 side by side waterfalls. (Maybe that’s why it’s called Aling-Aling waterfall and not just Aling Waterfall). The water falling down makes a basin pond of about 4 meters in depth, where people can swim or just enjoy the fresh water from the waterfall. 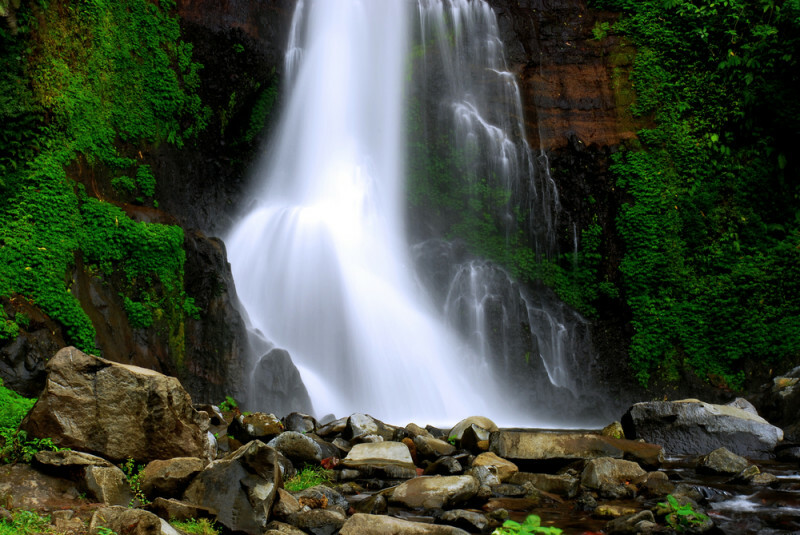 For all the trekkers and hikers, the Nungnung waterfall is the best place you can trek to. To reach the waterfall, tourists have to climb down a number of stairs and see the waterfall from close range. After the trek, tourists can either chill out on the sofas provided or have a little snack from the locals. The atmosphere is very cool, thanks to the water discharge from the falls being strong. After being promoted as a tourist attraction in 1996, the security has been enhanced and steel rungs have been installed throughout the length of the steps for safety. 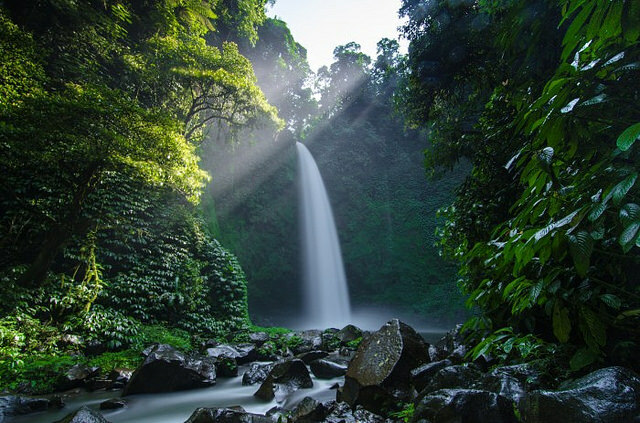 The Sekumpul Waterfall is considered the most beautiful waterfall in all of Bali. From the allocated parking lot, the waterfall is quite a walk down a long winding staircase, dirt roads and slippery mud. This waterfall is not named the most beautiful for nothing. 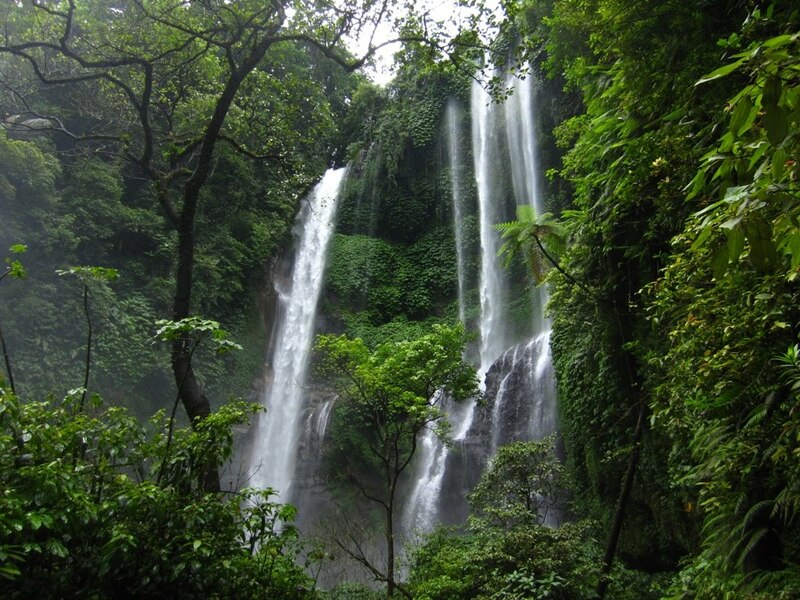 It is a collection of 7 different falls scattered throughout the lush greens of Bali. 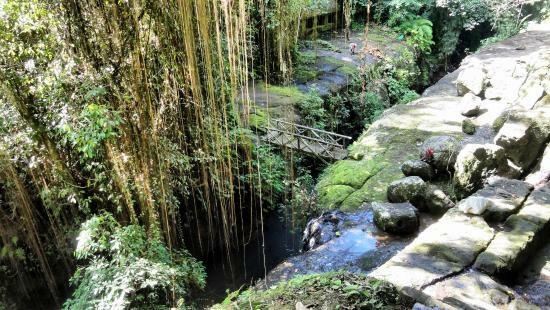 The Gitgit waterfall, located on the northern plateau of Bali is also one of the must see tourist attractions of Bali. The water runs throughout the year, and it is common to see wild monkeys round and about the area. The calm nature of the surroundings and the bubbling of the waterfall makes it a place of peace and serenity. Yeh Memph Waterfall (which means flying water waterfall) or Les Waterfall is a 30 mtr high waterfall located right in the middle of the jungle. Despite that, the road to the waterfall is easy and relatively even. The lush surroundings on the trail has farms on the way from which you can try to grab a small snack to munch on the way. Fruits like bananas and jackfruits grow in abundance throughout the trail and a local guide usually leads the tourists to the waterfall. Adventure lovers can also climb up right next to the waterfall and slide down on a natural water-slide. Through the valley, one can even catch a glimpse of the ocean. Being as rich as it is in culture, history and nature, Bali provides a number of culture tours which are more or less similar in nature. Here are our recommendation for the 2 best tours. 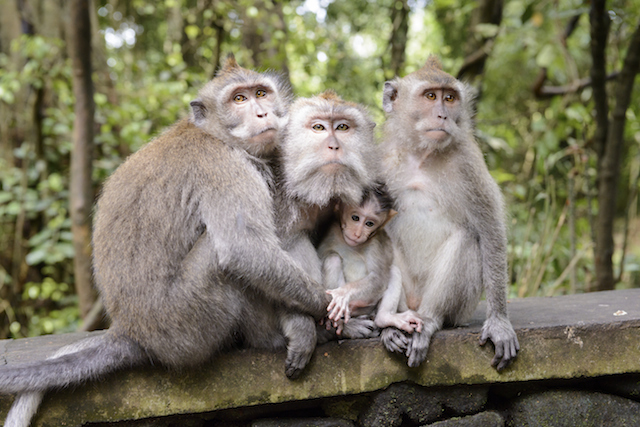 Spend an afternoon getting acquainted with the playful monkeys in the sacred Monkey Forest. Get a chance to explore Balinese Culture with the monumental Royal Temple of Mengwi, a structure filled with shrines, intricate carvings and protective moats. The guides are well versed in the Indonesian Culture and provide spectacular insight into the country’s colourful heritage. And last but not the least, enjoy the traditional fried tapioca and sweet potato cultivated in unique Balinese style. The sunset temple of Tanah Lot is truly a sight to behold. 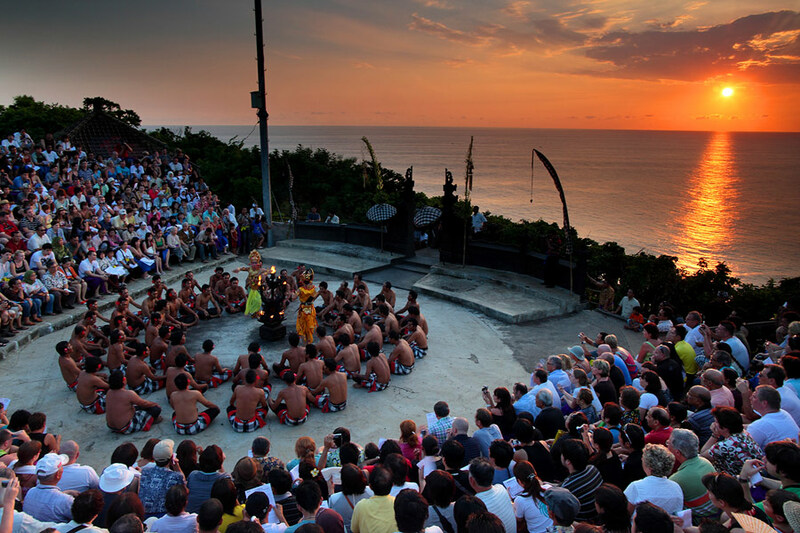 With free hotel and port pickup and drop, this tour offers tourists a glimpse of the rhythmic chanting of a Kecak dance performance at Uluwatu Temple. The glittering Indian Ocean as a backdrop for the performance makes it all the more beautiful and absolutely perfect for honeymooners. During the performance, dinner is served at candlelit tables for tourists. Planning a Bali honeymoon? Reasons why you should avoid it at all costs!